Our pourers, table dispensers and sauce boats come in many different materials and shapes that make them appropriate for casual to formal service at home or your restaurant. Keep toppings and sauces organized for efficiency and easy dispensing while they look fashionable and stylish as they sit on your tabletops or counters. 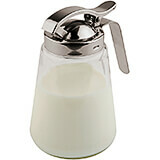 3.38" X 3.38" X 5.5"
This elegant syrup or honey dispenser is durable and easy to clean. It has a spill-proof spout mechanism. It is made of glass and stainless steel. 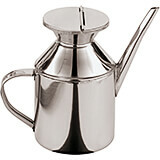 Material: Stainless Steel.Capacity: 0.15 Qt. 9" X 3.75" X 9"
This Paderno world cuisine 9" high diameter copper/tin oil dispenser has numerous benefits. Material: Copper.Capacity: 0.5 Qt. 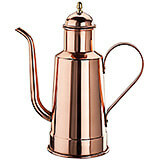 10.625" X 4.5" X 10.625"
This Paderno world cuisine 10-5/8" high diameter copper/tin oil dispenser has numerous benefits. Material: Copper.Capacity: 1.12 Qt. 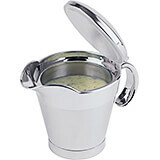 5" X 5" X 5.125"
The APS Paderno World Cuisine 13 1/2 ounce insulated stainless steel gravy boat has a spout. It has a top diameter of 7 3/8", a bottom diameter of 5" and a height of 5 1/8". It is a staple in any kitchen. It's hinged lid makes it easy to open and close. It keeps sauces and dressings warm at the table. It is beautiful and dishwasher-safe. 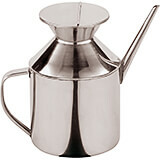 Material: Stainless Steel.Capacity: 0.42 Qt. 2.75" X 2.75" X 4.5"
The Paderno World Cuisine 1/2 quart stainless steel soy sauce & oil dispenser is a staple in all Asian restaurants. It has a small handle and a long, thin spout. It also has a lid. It measures 4 1/2" high and has a circumference of 2 3/4". It is dishwasher-safe. 4.375" X 4.375" X 6.75"
The Paderno World Cuisine 1 3/4 quart stainless steel soy sauce & oil dispenser is a staple in all Asian restaurants. It has a small handle and a long, thin spout. It also has a lid. It measures 6 3/4" high and has a circumference of 4 3/8". It is dishwasher-safe. 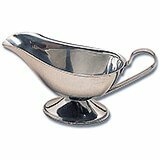 Stainless Steel, Gravy Boat, 6.75"
6.75" x 2.75" x 2.5"
This gravy boat is perfect to pour the right amount of gravy or any other sauce with style. 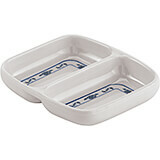 It features an easy pour spout and lovely curved handle suitable for casual and formal dining. 18/8 stainless steel. Measurements: 6 3/4" x 2 3/4" x 2 1/2". Stainless Steel, Gravy Boat, 8.75"
8.75" x 3.2" x 2.75"
This gravy boat is perfect to pour the right amount of gravy or any other sauce with style. It features an easy pour spout and lovely curved handle suitable for casual and formal dining. 18/8 stainless steel. Measurements: 8 3/4" x 3 1/5" x 2 3/4". 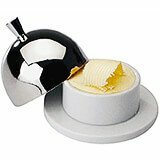 Porcelain Butter Dish, contemporary / modern design. With mirror-finished domed lid. Measurements: 3 1/2" Diam. x 2 3/4" H.